The older Boy Wonder becomes, the more I play the numbers game – trying to convince myself that we have more time together than we really do. I know his growing up and leaving the nest isn’t the end of our relationship, but in a lot of ways, it marks the end of a comfortable era. No longer will he ask if he can eat cookies before dinner or stay up late. No longer will I have the ability to check on him in bed before falling asleep. No longer will he be the first messy-haired face I see in the morning. One day Boy Wonder will be grown, and if I’ve done my job correctly, he’ll be leading a productive life away from home. He’s coming up on 11 years old, guys. Where those first 11 years went, I don’t know. I lost a few years to depression, lost a few more with the arrival of my second child, and now I feel left with only a small balance of memorable years remaining. Somewhere in my heart this just doesn’t seem fair. If the first 11 years passed this quickly, there’s simply no telling how fast the next 7 will go. I’m not done with his childhood, and yet I’m becoming increasingly aware that he is. When I came across 20 Things to Say to Your Daughter Before She’s Grown, I knew there was so much more I wanted and needed to say to my son. 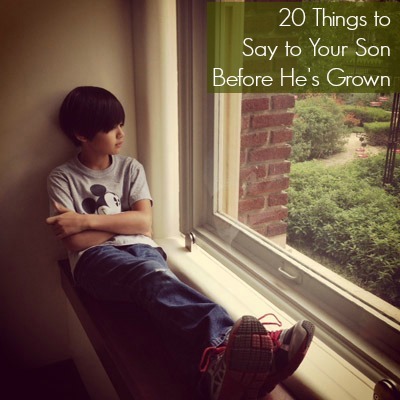 Take a look at 20 things I have left to say to my son that you may want to say to yours.